Roberto Cortes, President and CEO of Volkswagen Caminhões e Ônibus, has just announced important changes to the company’s management structure. Ricardo Alouche, Sales, Marketing and Aftersales VP, takes on responsibility for the Brazilian and International markets following the merger of the two commercial teams. Leonardo Soloaga is the new International Sales Director, reporting to Ricardo Alouche. In Brazil, regional sales coordination will be centralized in the company’s offices in the cities of Rio de Janeiro and São Paulo. “These changes will deliver even better results and improve our agility as we look for opportunities to increase sales and services. We have identified tremendous potential for synergy between the different commercial departments, which have operated as separate units until now, with positive impact on our growth plans”, explains Roberto Cortes. For Ricardo Alouche, the challenge will be to respond rapidly to client needs as the Brazilian economy recovers, as well as capturing the business of transport companies and independent haulers who up to now have been supplied by one of its competitors, which is closing down its operations in South America. He emphasizes: “We are the leaders in important market segments inside and outside Brazil, counting on a network of more than 300 authorized dealers and importers on three continents”. Marcos Forgioni, who was VP for International Sales, has left the company to dedicate himself to new opportunities. "We are sad to see Forgioni leave the company after almost two decades of dedication to the worldwide growth of the brand Volkswagen Caminhões e Ônibus. He played a key role in our internationalization, leaving a legacy for our future advancement”, says Roberto Cortes. “On behalf of all of VWCO, I thank Forgioni for his valuable contributions and I wish the best in his new challenges", states Cortes. With a B.Sc. 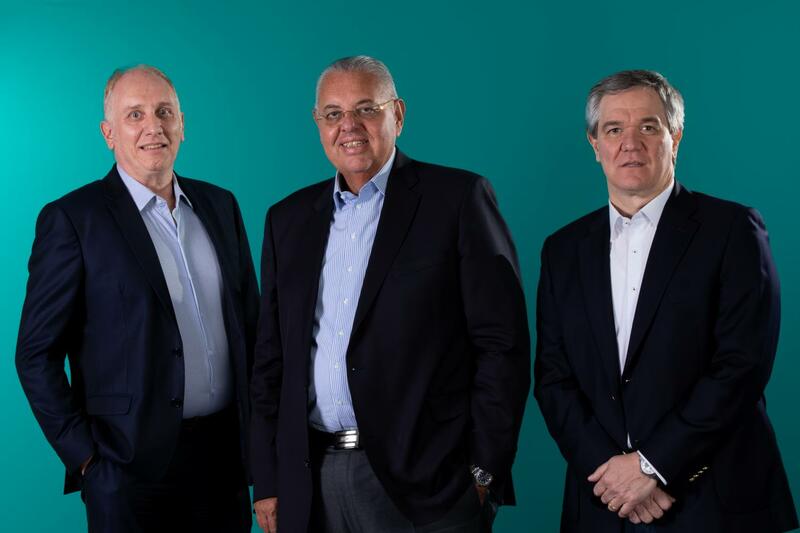 in Mechanical Production Engineering from the Paulista University, a post-graduate diploma in Marketing from ESPM and an MBA in Corporate Business Strategy from the Getúlio Vargas Foundation (FGV), Ricardo Alouche started working in 1986. Two years later, he was hired by Volkswagen Caminhões e Ônibus, and has gone on to build a highly successful career in executive positions in the Sales, Marketing and Aftersales areas. With a B.Sc. in Industrial Engineering from the University of Buenos Aires and having occupied important positions in the Financial, Product, Export and Aftersales functions for Volkswagen in Germany, Brazil and Argentina, Leonardo Soloaga joined the Volkswagen Caminhões e Ônibus team in 2014, as Director General of MAN Truck & Bus Mexico. He went on to occupy positions in the New Products and Markets Strategy Directorate. In addition to International Sales, Ricardo Alouche takes on responsibility for National Sales, Marketing, Aftersales, Parts & Accessories, and Sales Administration. Founded 38 years ago this month, Volkswagen Caminhões e Ônibus has produced almost 1 million vehicles to date. With factories in Brazil and Mexico, the company operates in more than 30 countries in Latin America, Africa and the Middle East. Responsible for worldwide sales of Volkswagen Caminhões e Ônibus models, the company also sells MAN trucks and buses in Latin America and has around 4,000 employees.